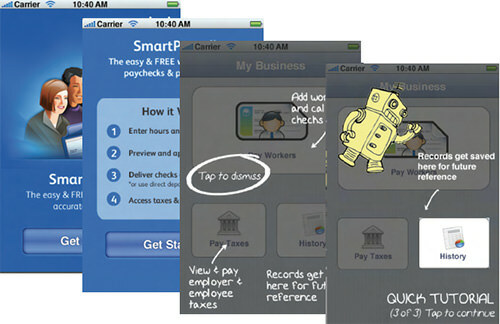 After the release of the first edition of Mobile Design Pattern Gallery, Intuit asked me to speak with its mobile team. I spoke at a high level about the value of patterns across industries (fashion, architecture, software and others) and how they are a useful teaching tool. Alissa Briggs, a senior UX manager at Intuit, followed my talk with a case study from Snap Payroll. Imagine my surprise when she walked through each of the “invitation” patterns from my book Dialog, How It Works, Tour and Transparency, and showed how they failed to onboard users effectively. Users were confused or frustrated (or both) by these extra “helpful” screens. 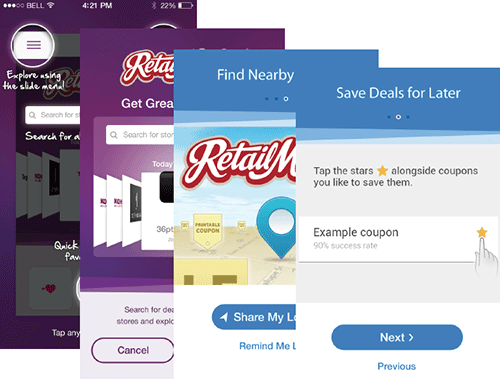 Shortly thereafter, I was working with RetailMeNot, tasked with designing its iOS and Android app tutorial. The product team wanted to make sure that users were clear about the value proposition of the tool and knew where to access certain actions (favoriting a store, saving a coupon, etc). We thought that a very short tour (three steps) or a video demo might work. Some of the stakeholders really liked the idea of a transparency, so we tested that as well. But instead of engaging users, these designs just frustrated them. 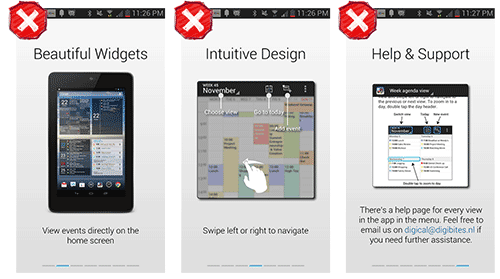 In summary, user testing showed that users skip or otherwise ignore dialogs, tours, video demos and transparencies. At best, users find them a minor inconvenience. At worst, the patterns significantly aggravate new users who are trying to get into the app. Why Do These Patterns Fail? So, why don’t these patterns work? I turned to the field of game design for answers. Game designers have always known that you can’t drop new players into the middle of a firefight and expect them to enjoy the experience. Most players would be dead before figuring out how to fire their weapons and fight back. In game design, some methods of driving deep engagement are much more effective than others. The same holds true for mobile apps. While the stakes might not be (virtual) life or death, the frustration that users experience when they don’t know how or what to do is the same. And when that happens to too many of your users, it’s game over for your app. Portal offers a safe environment for players to figure out the controls while advancing in the game. 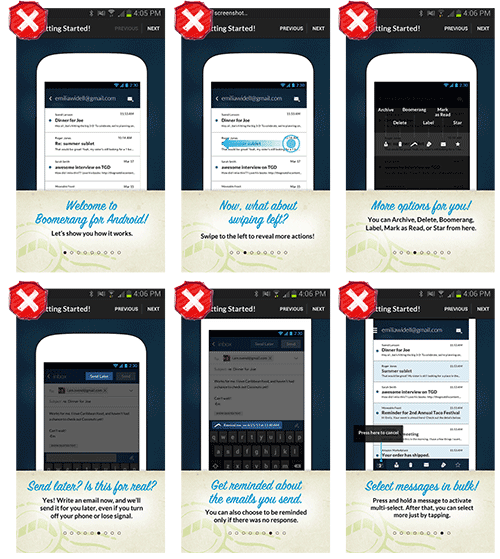 Too much text makes for a “tell, don’t show” approach, which works against the strengths of mobile apps. Instead, tutorials should “show, not tell”; they should be interactive, so that users learn by doing. When someone practices an action beforehand, they’re more likely to remember how to do it when they need to than if they’d merely been told how to do it. Boomerang for Android has too much text (see also rule 2: “No Frontloading”). 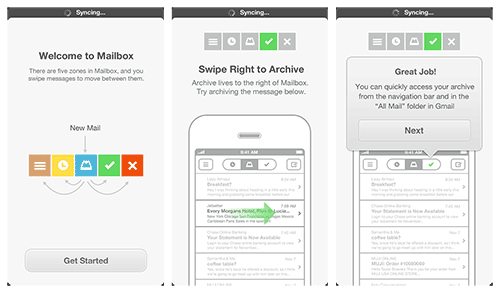 Mailbox for iOS’ tutorial text encourages the user to learn by doing. In DigiCal for Android, the text is abstracted from the activities it describes. 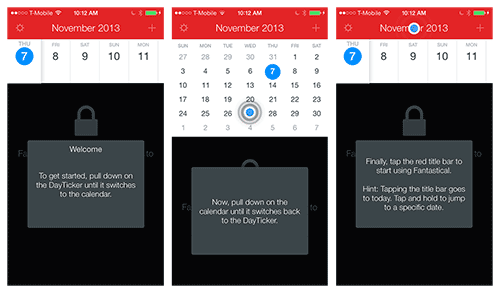 In Fantastical for iOS, the tutorial invites the user to work through the gestures that they need to learn. 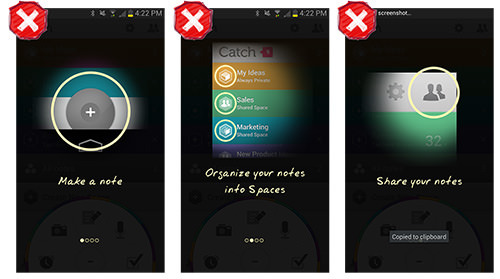 Catch for Android’s tour describes features and actions but doesn’t let the user try them. 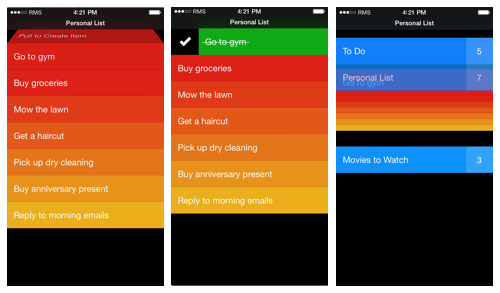 In Clear for iOS, the default view is preloaded with tasks that the user learns by doing. Resist the urge to use text if there are ways to show rather than tell. Use text to prompt the “cause,” and let the user observe the “effect” by doing. “If you frontload your tutorial and teach the player everything at the beginning,” Extra Credits says in “Tutorials 101,” “they’ll be overwhelmed with information and undersupplied with engagement.” Replace the word “player” with “user” in that sentence, and its relevance will be obvious to app designers. Rather than overwhelm users with information that they will probably forget by the time they need it, provide the information in short, easily digestible chunks precisely when they need it. Remember that you’re making a first impression here. Wouldn’t you rather make a first impression that leaves users wanting more rather than less? Dooo for iOS’ frontloaded information goes on and on for an overwhelming 11 pages. 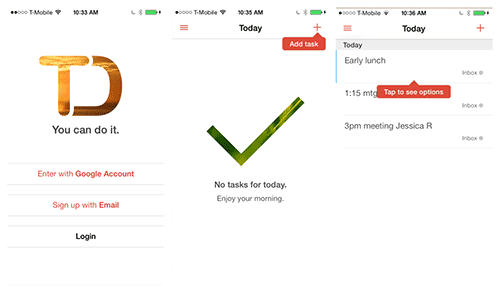 In Todoist for iOS, a tip invites the user to add a first task; then, another prompt introduces the options menu. UserTesting’s recent post “Six UX Lessons Learned From the New Facebook App, Paper” affirms that “users love a guided tour” – “guided tour” meaning a series of interactive tips during the user’s first experience. 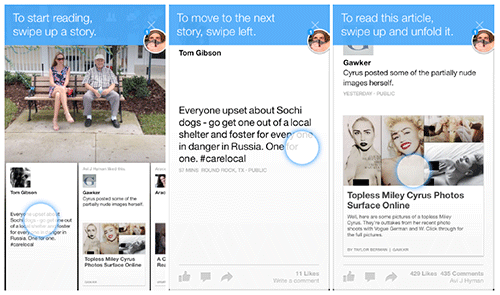 Facebook’s Paper app uses interactive tips in the context of a flow. Don’t overload users up front with all of the information they will ever need. Give it to them in bite–sized chunks, just where and when they need it. Actually, you may recall that the rule from “Tutorials 101” is “Make it fun.” Of course, “fun” is not appropriate for all apps. But when the video’s narrator says, “Your tutorial should be as engaging as any other part of your game,” we can see that in every other sense, this rule applies to our world. Even if we can’t make learning our apps fun, there are certainly ways to make it rewarding and flow seamlessly into the app’s overall experience. And a good way to do that is with interactivity that enables the user to actually accomplish things. This imparts a sense of agency that reinforces what the user learns. Even when “fun” is not the right tone to strike, instilling a sense of playfulness is still sometimes appropriate. Let’s look at two apps that take different approaches to this, NBC News and Flipboard, the latter of which exemplifies the right approach. 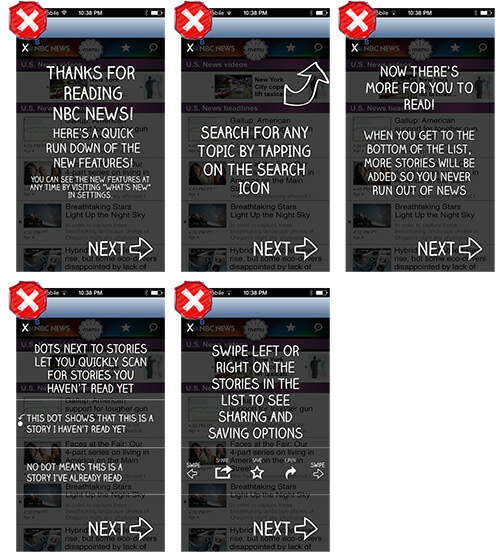 Despite its “playful” font on the five transparency screens, NBC’s tutorial still feels like a lecture. Flipboard, on the other hand, feels dramatically different on first being opened. Every subsequent flip transition reinforces the swipe gestures that a new user needs to make in order to explore the content in their Flipboard. Playful and rewarding. NBC News for iOS has a playful font, but the long lecture isn’t rewarding. 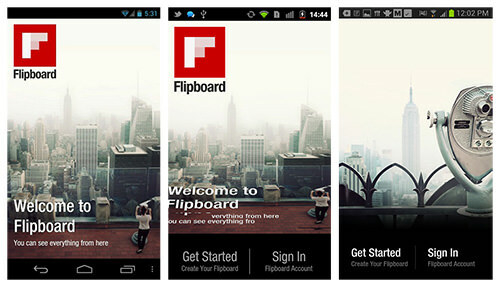 Flipboard for Android and iOS embeds playful prompts to engage the user and reinforce the key gestures needed to navigate the app. Make deeper engagement with your app rewarding. Consider adding elements of playfulness where appropriate, and create a sense of urgency by enabling users to learn by doing. Remember those “A–ha!” moments in science class when you came to understand a concept by testing it in a simple experiment? That’s what we’re talking about here. Of course, the teacher had explained the concept to you, but it was by performing the experiment that you actually learned it. The same idea applies with tutorials. And if you follow the first three rules, this reinforcement will largely take care of itself. It could be as simple as accompanying an action demonstrated in a tutorial with a very subtle bit of visual or aural feedback. This rule complements the “No frontloading” rule. Rather than trying to show off everything in your app at once, craft an experience that invites the user progressively deeper into the app. By revealing more advanced features over time or by giving unexpected “rewards” as they progress, you’ll reinforce what the user learns as they use the app. Polar offers a tip to power users after a few polls have been answered. 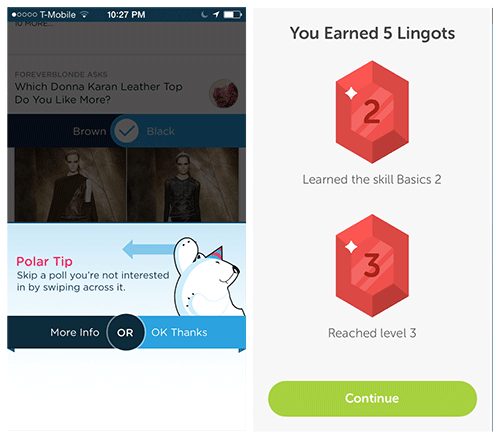 Duolingo users earn rewards and level-ups by mastering skills. 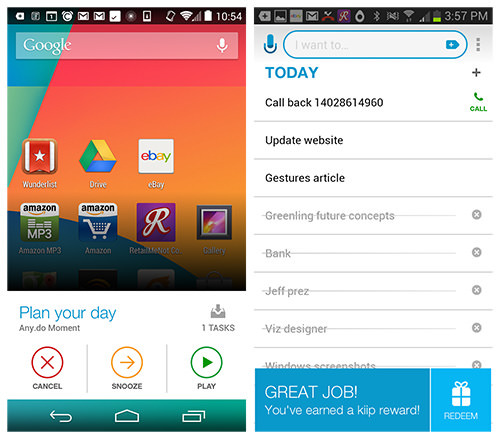 Any.do puts a widget on Android’s home screen to encourage engagement and offer spontaneous rewards. Learning isn’t a one–time thing. 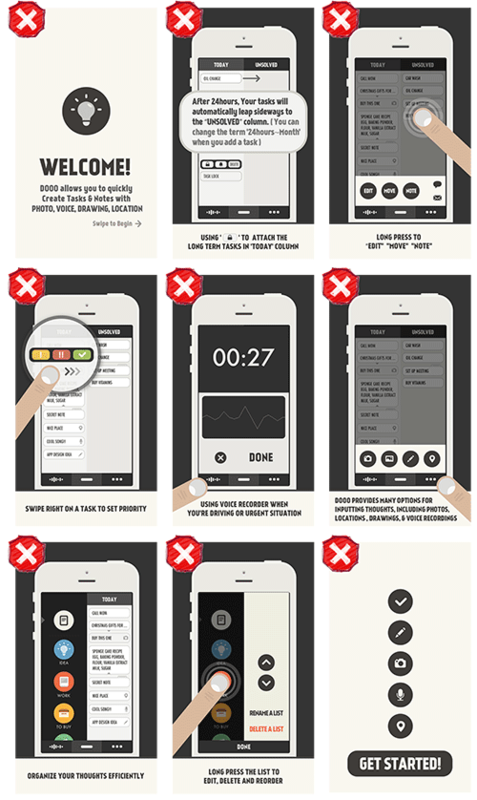 Using an app should reinforce what the tutorials have helped the user learn. Simple, properly conducted user testing will reveal any stumbling blocks. Observe your users to see where they get stuck and where they have problems. Listen to their comments as they interact with the app. Don’t question them until later; if you question them as they are using the app, you will likely lead them unconsciously to the answers you want to hear. The designers of Snap Payroll ultimately discovered through user testing that a guided experience, or contextual tips, yields the best results. And after four rounds of testing at RetailMeNot, we arrived at the same findings. 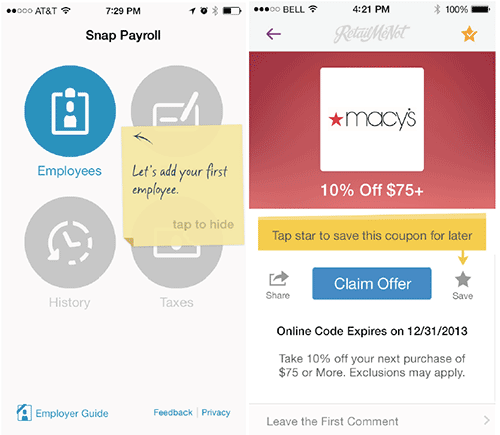 Snap Payroll’s contextual tips tested very well with users, as did RetailMeNot’s. Familiarity blinds you to what users need to learn. Let users show you themselves through unbiased user testing. Published here on February 18, 2015. 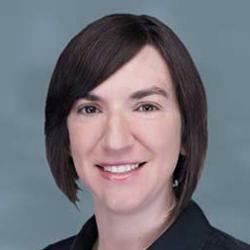 Theresa Neil lives and breathes user interface design. Her Austin-based UX team works with a diverse mix of Fortune 500 companies, non-profit organizations, and local start-ups. You can follow Theresa on Twitter at @theresaneil. Making Sense of Mobile Within the Enterprise by James Robertson James Robertson shares some tips on planning and delivering enterprise mobility.